are weird right? I totally saw this while driving home from Kansas City the other weekend. This head is just "hanging" out in this person's back seat. The weird part is that the guy driving the car looked like he could be 60 years old and and looked at us as though he had no clue why we were taking a picture of his car. 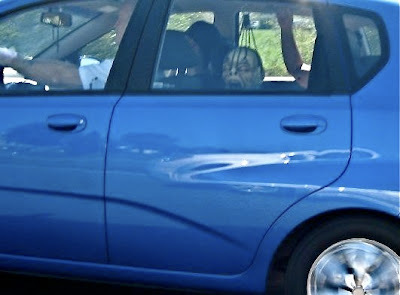 The even weirder part is the fact that the person in the backseat with this head had to be the sweetest looking grandma I have ever seen. hahaha, this is absolutely un-topable!!! ;-)) wish i could have seen this for real! That is so creepy! I love that you took a picture! ha! I went to peopleofwalmart.com for the 1st time yesterday. Very entertaining! That would have seriously freaked me out if I'd seen it. I love Halloween but am too scared of some of the things associated with it - especially scary films!! Ok, I have not seen this lately, but it is a story worth sharing. I was in my dorm my freshman year of college, studying away for finals, and I heard some noise outside. I looked out the window and saw SANTA RIDING AN ELEPHANT right down Hammon's Parkway. It was soooooo strange because there were no other signs of a parade. It was the most random thing that I have ever seen and I love it.